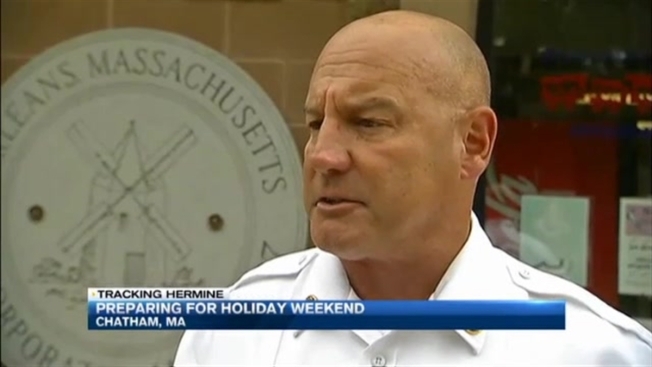 Emergency crews on Cape Cod say they will be on standby Labor Day weekend as Tropical Storm Hermine inches closer to New England. The storm may bring rain, wind and high waves to the coastline. The Coast Guard is warning mariners to use caution on the water. Fisherman John Tuttle says he and his friends are getting prepared. "We're putting extra lines on the boats and stuff like that," he said. "And some of the guys are moving their boats toward a cove where it's a little bit safer." Orleans Fire Chief Anthony Pike says he's not too concerned, but he did brief town representatives about the upcoming storm Friday morning. "It does give us an opportunity to dust off some of the plans that we have, in case we do have a dangerous storm," he explained. Tourists and residents who spoke with necn say they won't let the storm affect their holiday weekend plans. "Tomorrow is supposed to be a beautiful day and we're going to enjoy what we can," said Massachusetts resident Maura DiMarco. Pike says it is always best to be prepared. "You should have some emergency preparations in your home," he said. "Flashlights with good batteries, provisions, water and food." Emergency officials say if you plan on heading to the beach Labor Day weekend, keep a close eye on your small children. Waves may get as high as 15 feet.